'India's Tryst with Destiny' is an economic policy book which supports more reforms and advocates a more active role for private players. Also available under the name, 'Why Growth Matters: How Economic Growth in India Reduced Poverty and the Lessons for Other Developing Countries', this book is written by Jagdish Bhagwati and Arvind Panagariya – two prominent Indian economists. Bhagwati is considered to have started the intellectual support for reforms started in the 1980s and more vigorously in the 1990s. Arvind Panagariya is current chairman of Niti Aayog of India. During these years of economic reform, India’s economy was opened up and 'License Raj' was removed from many sectors. This book is all about evaluating the effects of those reforms and replying to critics arguing against those reforms based on the social indicators. Also, through this book, authors advocate a significant role of private players in education, health, and industry. At few places in the book, authors have criticized Amartya Sen and Jean Dreze for having the view that growth has done relatively little for the upliftment of masses. Bhagwati and Panagariya mention about the socialism under the Nehru and Indira Gandhi. Although much celebrated as a socialist, Nehru emphasized on production in many speeches and he thought that only more production can provide enough resources to eradicate poverty. Also, criticisms on the basis that Indian planners pursued growth as an end are refuted by the authors as they cite reports from First Five Year Plan drafted by the Planning Commission which gives due emphasis to education and health sector. According to authors, socialism under Indira Gandhi was of different hue and too many permits and licenses were introduced which pleased the ultra-left section of Indian politics, but in the end proved detrimental to the growth. With fewer resources available, the spending on public goods – with social implications – took a hit and India did not show much improvement in social indicators. Citing statistics, authors claim that after 1991, a much larger proportion of the population has been lifted above BPL. In the first part of the book, authors have debunked many myths surrounding India’s growth story. Comparisons with Bangladesh and China were discussed. In the case of Bangladesh, authors say that West Bengal which has a shared history and geography outperforms Bangladesh. They argue that Bangladesh has better health indicators at the time of independence. In the tumultuous decades of the 1970s and 1980s, these indicators took a hit but present conditions hint towards the return to the post-independence condition. They argue along similar lines for comparisons with China and say that China had a head start of many years. Taking the example of one more myth propagated by few that due to reforms, India is now in the Gilded Age that was in the United States in the late nineteenth century. Authors refute such claims by saying that because of reforms many entrepreneurs with a clean image have risen like Narayana Murthy of InfoSys, Azim Premji of Wipro and Uday Kotak of Kotak Mahindra Bank, and have embraced CSR and PSR. They also say that in contrast to Gilded Age of the USA, the condition of laborers is much better in India. In the second and third part of the book, authors talk about Track 1 and Track 2 reforms. By Track 1 reforms, they mean reforms in regulations and infrastructure which help in ease of doing business. These reforms include labor laws, land acquisition laws, infrastructure, higher education and agriculture. Authors argue that ease in regulation will help in increasing the firm size. Large and medium firms are known to provide better salaries and facilities as it has been proved in the case of China. Authors also want foreign universities to be allowed to open campuses in India. Even though few faculties might move to these universities from premium institutes like IITs and IIMs, in the end, it will benefit Indian students only. It may also help in the return of educated Indians employed in universities abroad. Track 2 reforms are in the area of employment, adult education, food security, health care and elementary education. Here also authors argue for a more active role by the private sector as the decades of experience has proved governments to be ineffective in providing these necessities with the presence of massive corruption. In many areas authors, argue against targeted redistribution of in-kind benefits because as long as these benefits are available at the market price the beneficiary always has an option to sell these for a price. They argue more in favor of cash transfer. This book was structured in a way that it first argues against the myths and then it builds the case for more reforms. Free from too many economic jargons and with technical terms explained wherever possible, this book does not need any prerequisite. 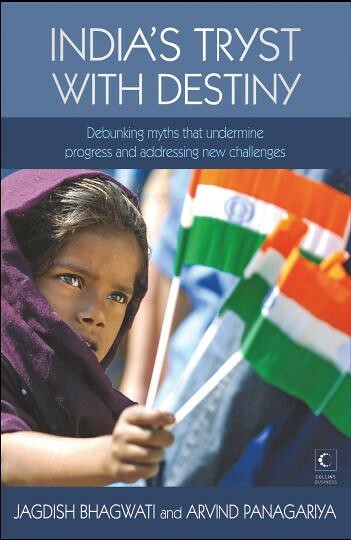 To know the views contrary to the authors of this book, a book by Amartya Sen is recommended.